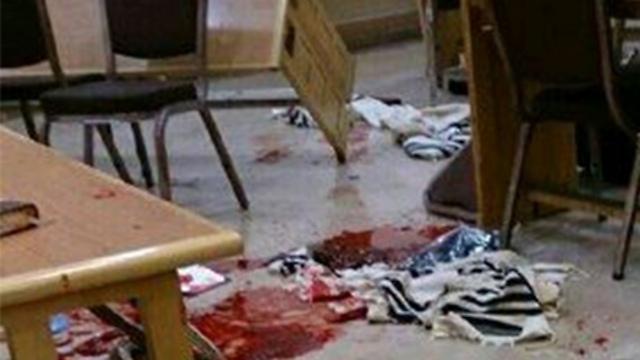 November 18, 2014 - Four people were murdered Tuesday morning when two terrorists brutally attacked worshippers in a synagogue and yeshiva in the Har Nof neighborhood in Jerusalem. Seven people were wounded, including two police officers. At around 7am, the terrorists - wielding massive knives and a gun - entered the Kehilat Yaakov synagogue on Harav Shimon Agasi Street, which includes both a synagogue and yeshiva (rabbinical seminary), and carried out attacks in more than one location. The two were killed following a gunfight with security forces who arrived at the scene. The wounded were taken to Shaare Zedek Medical Center and Hadassah Ein Kerem. At around noon Tuesday, the hospitals said that two people were in critical condition, two people had sustained serious wounds, one person was in moderate condition, and two more were lightly hurt. "Two terrorists entered the synagogue in the neighborhood of Har Nof. They attacked with an axe, a knife and a gun. Four worshipers were killed. The police who arrived at the scene shot and killed the two terrorists," said Israel Police spokeswoman Luba Samri. Images from the aftermath of the attack showed prayer shawls lying on the floor in pools of blood. "I tried to escape. The man with the knife approached me. There was a chair and table between us ... my prayer shawl got caught. I left it there and escaped," Yossi, who was praying at the synagogue at the time of the attack, told Channel 2 TV. He declined to give his last name. "This is an area with a number of rooms," said Magen David Adom spokesman Zaki Heller. "The wounded were scattered throughout different rooms and the paramedics who arrived at the scene dispersed to deliver first aid. The wounded were quickly evacuated by ambulance to hospital." He said,"It is definitely true to say that the images there - of casualties wearing prayer shawls - are very difficult." Akiva, a Magen David Adom paramedic, said that he was greeted at the scene by the sight of a worshiper with stab wounds. "Inside there was someone singing. I ran into the synagogue, there was a gunshot victim lying on the floor. I tried to treat him, but the gunfire started in my direction and we fled. I pulled the wounded man along," he said. Palestinian sources named the terrorists as cousins Ghassan and Uday Abu-Jamal, from the Jabel Mukaber neighborhood of East Jerusalem. The two were related to a prisoner released in the Gilad Shalit prisoner exchange. An official Hamas statement said that the attack was a response to the death of bus driver Yusuf Hassan al-Ramouni, who was found hanged at a Jerusalem bus terminal Sunday night. While al-Ramouni's family claimed foul play, autopsy results confirmed police's suspicion of suicide on Monday afternoon. Hamas said the attack was also a response to "the ongoing Israeli crimes at al-Aqsa (mosque). The Hamas organization calls for the continuation of acts of revenge." The attack comes amid spiking tensions in Jerusalem, which has seen a spate of terror attacks against Israelis. At least six people have been killed in Jerusalem, the West Bank and Tel Aviv in recent weeks, prior to Tuesday's attack. Jerusalem residents have already been fearful of what appeared to be lone wolf attacks using cars or knives against pedestrians. But Tuesday's early morning attack on a synagogue harkens back to the gruesome attacks during the intifada of the last decade. Tensions appeared to have been somewhat defused last week following a meeting in Amman by Prime Minister Benjamin Netanyahu, US Secretary of State John Kerry and Jordan's King Abdullah II. The meeting was an attempt to restore calm after months of violent confrontations surrounding the Temple Mount, holy to both Jews and Muslims. Israel and the Palestinians said then they would take steps to reduce tensions that might lead to an escalation. Netanyahu said last week that Israel had no intention of changing the status quo on the Temple Mount, where a Muslim trust enforces the ban on Jewish prayer at the site. This is not the first terror attack at a Jewish seminary in Jerusalem. In March 2008, a Palestinian terrorist infiltrated the Mercaz Harav rabbinical seminary in the Old City and opened fire on a crowded study hall, killing eight people and wounding six others.